By any measure the Bengal Tiger, India’s National animal is magnificent. It’s yellow fur with prominent black stripes are both distinctive and gorgeous. It is second only to the Siberian tiger in size among the big cats but it takes second place to no other feline in grace, beauty and agility. 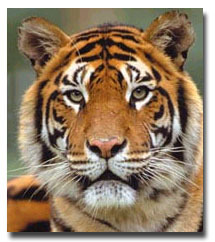 Although christened “Bengal” tiger, this animal is found in almost all parts of India. However, destruction of their habitat has confined them to the 25 tiger reserves and scattered forests across India.